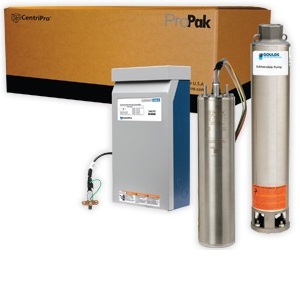 KITS INCLUDE: -CentriPro Three Phase Motor 1.5 - 5 HP, 230 V -CentriPro Aquavar SOLO Controller with Transducer -Goulds Water Technology Pumps GS Water End (pump) (Note: ProPak kits do not include pressure tanks. Tanks must be ordered separately.) A variable speed controller complete with a water end (pump) and three phase motor conveniently packed in one carton for installer convenience. Kits are available with 2, 3 or 5 HP controllers and motors from 1.5 to 5 HP. They feature pump/motor combinations sized for high speed operation, units are configured to operate between 30 and 80 hertz.